You know that jaunty song, ‘Feliz Navidad’? Well, that’s just one way to say Merry Christmas in Spain. In Catalan, you say ‘Bon Nadal’ and in Basque country, you would say ‘Eguberri on’. Regardless of how you say it, Christmas and Christmas parties are a big deal in Spain. Cava is the Spanish version of Champagne. This sparkling wine comes in white and rosé forms and is produced using the champenoise method, meaning it actually tastes quite similar to Champagne too. Spain makes some sensational beers too so make sure you stock up on a variety across the spectrum from dark ales to pale lagers. In Spain, you wouldn’t dream of hosting a party without paella. It’s not just a dish – it’s a conversation piece. Standing around watching (and smelling) the paella cook is all part of creating a festive atmosphere. Choose from the traditional recipe with chorizo, chicken and prawns, or seafood and vegetarian, and let the Food Adventura Chefs take care of the rest, including cleaning up. Whether you want roving canapés, or platters of tapas placed strategically around the room, guaranteed crowd pleasers include ham croquettes, garlic prawns (served with bread to mop up the garlicky oil), meatballs, fried potatoes, empanadas and chorizo (always chorizo!). This is where you can get super traditional. Mandarins, dates, walnuts, marzipan and nougat are all traditional Christmas foods but there’s also some classic desserts that will make mouths water. Creme Catalan (similar to a creme brulée), churros with dipping chocolate, Spanish cheesecake and any kind of flan. Christmas is also a time when people eat a huge range of specialty biscuits so seek these out at a speciality grocer or bakery. Seems obvious, right? It’s a party. But have you ever hung out with Spanish people? They have a freakish ability to stay awake, dance enthusiastically and sing, play guitar and make a lot of noise. Warn the neighbours – or better still – invite them over! 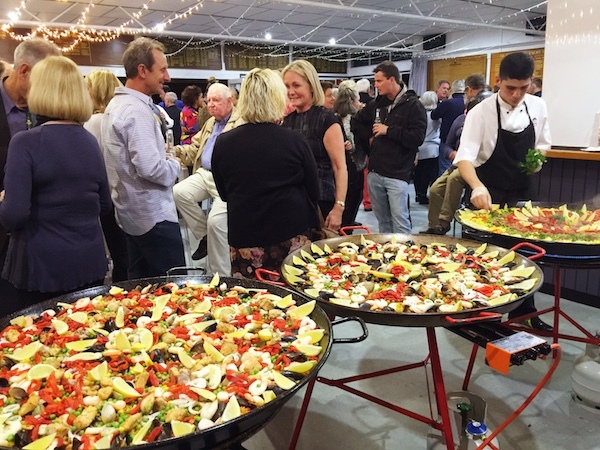 Need help organising a Spanish-style paella party for your annual Christmas bash? Contact our friendly team today to discuss your needs.